The 2007 Commencement speaker for the NSU undergraduate ceremony was Antonia Novello, M.D., the first Hispanic and first woman to serve as U.S. Surgeon General. Her work has taken her around the globe to bring attention to many pressing issues, particularly those regarding AIDS research and children's health. To honor her achievements, Novello was awarded an honorary doctor of humane letters, as approved by the NSU Board of Trustees. Born in the small town of Fajardo, Puerto Rico, she suffered colon abnormalities from birth that cast a shadow over her childhood and adolescence. Novello graduated from high school at age 15. While attending the University of Puerto Rico at Rio Piedras, she finally underwent her first surgery to correct her medical condition. At age 20, she traveled for treatment at the Mayo Clinic for an operation that resolved the last of these complications. She received her Doctor of Medicine degree from the University of Puerto Rico at San Juan in 1970. After completing an internship in pediatrics at the University of Michigan Medical Center, Novello held fellowships in pediatric nephrology there and at Georgetown University Hospital in Washington, DC. In 1979, she joined the National Institutes of Health (NIH) in Bethesda, Maryland, and rose to become Deputy Director of the National Institute of Child Health and Human Development. Her special interest in pediatric AIDS caught the attention of the White House. 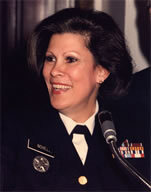 In 1990, President George H. Bush appointed Novello to be Surgeon General of the United States. Although she never shrank from controversy, Novello won praise for her initiatives to address the health problems of America's young people, whom she called "a generation at risk." Highlights of her tenure included campaigns against smoking and marketing practices for fortified wine and beer. She also found new opportunities for Hispanic/Latino Americans to participate in health issues by convening national and regional meetings to discuss community health needs. She raised national awareness in the medical profession about the domestic violence epidemic in America, and worked to elevate public consciousness about underage drinking and alcohol abuse. After leaving office in 1993, Novello served UNICEF, the United Nations' children's health organization, traveling the world as Special Representative for Health and Nutrition. In 1999, she was appointed Commissioner of Health for the State of New York. Novello is a member of Alpha Omega Alpha (the Honor Society of the Medical Profession), The Institute of Medicine, and the Women's Hall of Fame. One of her guiding principles has been, "Service is the rent you pay for living, and that service is what sets you apart." The 2007 Undergraduate Commencement Ceremony took place on May 12 at 11:00 a.m. at the BankAtlantic Center in Sunrise, Florida.